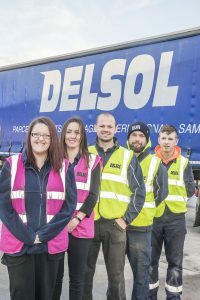 Staff at North Wales delivery firm Delsol have proved they are top of the class, with a host of new qualifications. Drivers, administrators and managers have successfully undergone training, as part of the company’s commitment to staff improvement. They have been congratulated by Dave Phillips, managing director at the company, which employs 125 people at its bases in Caernarfon and Sandycroft, delivering goods, pallets and parcels around the UK. Dave said: “Well done to all those members of staff who have just completed their training. It’s not always easy, fitting in studies around a job, so I admire their hard work and commitment. Overseeing the training is HR manager Kathy Jones from Sealand, who has also just competed her Level Five CIPD qualification, studying at Coleg Cambria at Deeside. The 33-year-old mum-of-two said: “I joined the company several years ago on the operations side and was encouraged to progress a career path with the company. The senior managers have been very supportive as they see the value of people developing their skills, right across the board, as it helps to retain staff and makes it a good place to work. The 36-year-old, who cycles to work as part of his training for Ironman contests, said: “I’ve always loved driving and from a young age wanted to be a truck driver, so doing it for a living is cool. I get to drive long distances, to the Midlands and across north west England. As well as my Class One HGV licence, I’ve also got my ADR, which means I can transport hazardous chemicals safely around the country. Fellow driver Stewart Harrison, 31, from Ruthin, has also gained his ADR hazardous goods licence with Delsol, enabling him to transport thousands of items from perfumes and medicines to industrial solvents and paints under the national Hazchem regulations. The 31-year-old former Ysgol Brynhyfryd pupil said: “I joined Delsol in 2013 as a van driver and I’ve gradually moved on to larger vehicles. I’ve presently got my Class Two HGV licence, and will be continuing to train for my Class One so I can drive the largest trucks in the fleet. “I believe, though, that this isn’t just a driving job but a career with a company that feels like a big family. Everybody knows everybody else, and we get on well. Claire Maddock, from Connah’s Quay, has gained her level Two in Accountancy through Coleg Cambria’s Northop campus. The keen darts player said: “I am now studying for my Advanced Level Three and want to go on to the professional Level, to fully qualify as an Accounting Technician. One of the company’s youngest recruits is 18-year-old Sam Williams from Saltney. The former Ysgol St David pupil is an apprentice fitter and is presently in his second year of a Level Two NVQ in motor vehicle mechanics at Coleg Cambria at Deeside. Mark Patrick-Hughes, who manages Delsol’s fleet in both its Caernarfon and Sandycroft bases, has just gained the Department of Transport’s Certificate of Professional Competence (CPC), as part of the company’s Operator Licensing requirements. Caernarfon-based staff who have also undergone training include former van driver Geraint Walker and ex-warehouse worker Aron Griffiths, who have both gained their Class One (CE) HGV licences, while forklift driver Robat Jones has passed his Class Two (C) HGV licence. Delsol offers same day, overnight and international delivery and collection services. Its fleet of 90 modern trucks and vans deliver items around the UK and across the globe to retail, commercial, industrial and private addresses, for large companies through to small enterprises and personal customers. Originally founded in 1999 in Bethesda, Gwynedd, Delsol opened a purpose-built delivery depot and warehouse facility in nearby Caernarfon in 2003, and six years later opened a second depot in Sandycroft, Deeside, Flintshire. Delsol is a member of APC Overnight, the UK’s largest independent parcel delivery network, as well as the TPN pallet network, which offers sustainable, cost effective and reliable distribution around the UK and Ireland, and into Europe. It is also part of the Hazchem network, the only pallet network dedicated to moving chemicals under strict regulations, from perfumes and medicines to industrial solvents and paints.